A while back I had a spot of trouble with my Elgato EyeTV Hybrid (turns your Mac into a digital TV/TiVO) and after running around replacing everything BUT that device (including antenna, cabling, connectors, waiting for exceptionally cold winter weather to break, etc, etc) I was informed that I couldn’t get a replacement for it due to expiration of warranty (and this was all happening with continual conversations with tech support). You would guess right if you thought this really chapped my hide. A few months later, and the purchase of a brand new EyeTV Hybrid (hey, it works! ), somebody from Elgato shows up on twitter and makes contact. Interesting and nice. He hears some of the details of my story. He mentions he will send me something to help make up for it. I am intrigued, and hesitant. What could make up for the hassle and wasted time and money? A couple weeks later a box shows up and inside is the brand new Turbo.264 HD USB stick! Sweet! 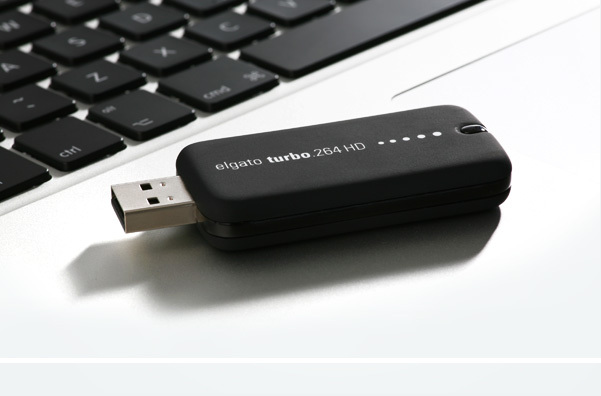 I immediately installed it on my MacBook Pro (2007) and convert some full HD video to 720p for online viewing. The results are very good and quite speedy. I was almost convinced. So, to confirm the initial testing, I took it downstairs to my HD home theater (1.8 Ghz MacMini with EyeTV Hybrid) and a few test conversions later I am completely sold. The Turbo.264 HD really does work FAST and with good quality. I converted several episodes of LOST and America’s Test Kitchen that I had saved and consistently got speeds of slightly better than real-time (about 30-36 frames per second) on full HD conversions down to 720p h.264 format for archiving. This type of process would have (and has) taken HOURS per show prior to the Turbo.264 HD, which means it didn’t happen very much if at all. The really great thing is that when I shoot video on HD, I can take the super large exported final file and pop it into Turbo.264 HD and make a Vimeo/YouTube 720p file in mere minutes. Which makes the Turbo.264 HD a VERY useful bit of kit.